So, you have qualified the SSC CHSL Tier 1 Exam 2017. Obviously, you have done it because now you are asking for the SSC CHSL Tier 2 Admit Card 2017 to appear in the upcoming descriptive test. Recently, the Staff Selection Commission has successfully announced the SSC CHSL Tier Result. Candidates who have qualified the tier 1 examination they are now called for the next round of this selection process which is tier 2 (descriptive test). Those contenders are now asking for the SSC CHSL Hall Ticket for Tier 2 which is available now. Such aspirants have to download their admit cards before the test. Many important details of this subject are well-descried on this web page. So, read out the complete information. The main objective of conducting this descriptive test is to assess the writing skill of the suitors which is needed in government jobs. So, candidates don’t take it lightly and start your preparation according to the examination pattern which is described underneath. New Update for Admit Card: Staff Selection Commission has issued the tier 2 admit cards. Candidates can easily obtain their admit cards using the link which is given in the end of this page. Latest Update: Here is a new update for those candidates who will take part in this test. Now, the Staff Selection Commission has decided to conduct this test on 9th July which was previously decided to be organized on 25th June 2017. Hall Tickets for this test will be available soon. For further updates, stay updated with us. In the month of November 2016, Staff Selection Commission, which is generally known as SSC, had issued an official advertisement about SSC CHSL Notification 2016. Under this notification, the authority had started the online registration procedure for the SSC Combined Higher Secondary Level Exam which is organized to recruit the suitable aspirants on various government posts. Around 64,00,000 (Sixty Four Lakh) students have applied for this test. After that, they have participated in the tier 1 exam that was held in January-February 2017. Now, the results of Tier 1 exam are out and the aspirants who are shortlisted for the upcoming descriptive test they are eagerly seeking the SSC CHSL Admit Car for Tier 2 Exam because they know that how imperative it is for the test. According to the authorized advertisement, after the results of SSC CHSL Tier II Exam, the organization will also conduct the Tier III Examination which will be conducted as skill test/typing test. This test will be organized as the qualifying examination. The final merit of the selected aspirants would be prepared on the basis of total marks of Tier I and Tier II. The SSC CHSL Descriptive Test will be conducted in Pen and Paper Mode and the duration of this examination will be for 1 hour. In this paper, aspirants would have to write any essay of 200-250 words and letter/application of 150-200 words. According to the official advertisement, we have come to know that the minimum qualifying marks in this test would be 33%. Candidates are advised to give their best performance in this test because it will be included for preparing the final merit list. Contenders can attempt the exam in their desired language either English or Hindi. The main importance of SSC 10+2 Exam Hall Ticket is that it is required to be carried by the applicants in the examination center. The another reason is that it contains vital information about the student like registration ID, roll number, exam timing, reporting timing, examination venue and location and other guidelines for the contenders. Hence, the aspirants are advised to download the hall ticket before the test. Admit cards are available now on the main website of the SSC. The candidates will be able to download their admit cards directly from this page because an authorized link to download the hall ticket is given at the last segment of this web page. To know the proper steps to get the admit card, take a look at the below. 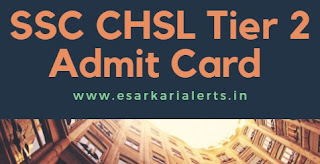 How to Download SSC CHSL (10+2) Tier II Admit Card 2017? Initially, go to the chief web portal of the Staff Selection Commission which is “ssc.nic.in”. Now, tap on the “admit card” tab which is accessible at the top side of the homepage. Click on the link of your region. Website of SSC for your region will be opened in your browser. Then find out the link of this test admit card and click on that link. Fill the required info such as Registration ID, DOB etc. After few seconds, your hall ticket will be visible on the screen. To end this process, download your admit card and get a hard copy of it. At last, we want to say that all appearing candidates must download their SSC CHSL Tier 2 Admit Card 2017 otherwise they will not be able to participate in the examination. For the latest updates about it, keep connected with our website.